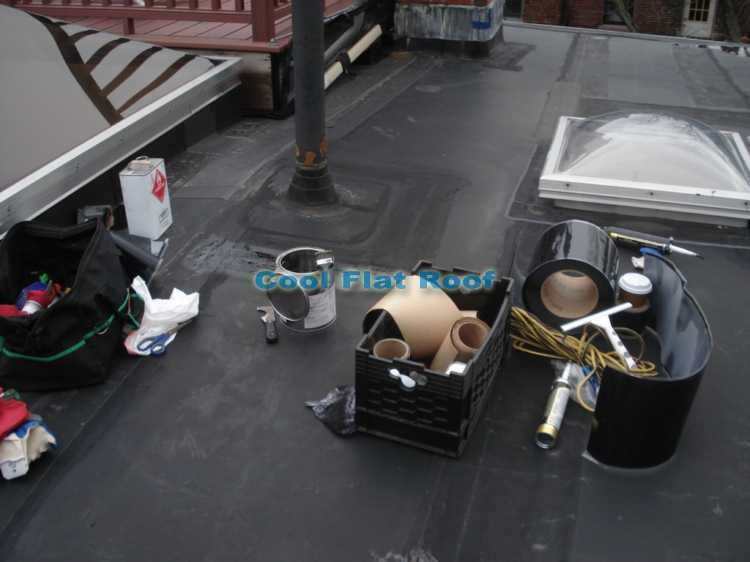 If you need your Flat Roof repaired in Massachusetts, we service the Metro Boston area! Learn more, and fill our roof repair request HERE. Flat roof reality check: leaks are an inevitable outcome for 99% of flat roofs in service today. If you have a flat roof, chances are that it is already leaking or will begin to leak soon, even if your roof is fairly new and was installed within the last 5-10 years. 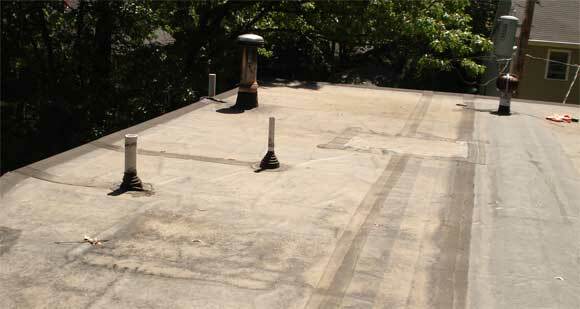 If your flat roof is leaking, this repair guide is for you! It will help you understand your options, as well as explain how to do an emergency repair yourself. You will learn basic flat roof repair techniques to fix a Rubber Roof or Tar & Gravel flat roof, using videos and step-by-step DIY Guides. We will also explain the true costs of roof repair – not just what a contractor will charge to fix your roof, but additional costs incurred after the roof patch leaks. As a result, you may have to spend more money on another repair, as well as interior repairs to your house. Step 1) If your roof is fairly new – call the roofing company that installed your roof and have them fix it. Or if your roof is near the end of its life, it is best to replace it rather than throw any more money away on repairing it. 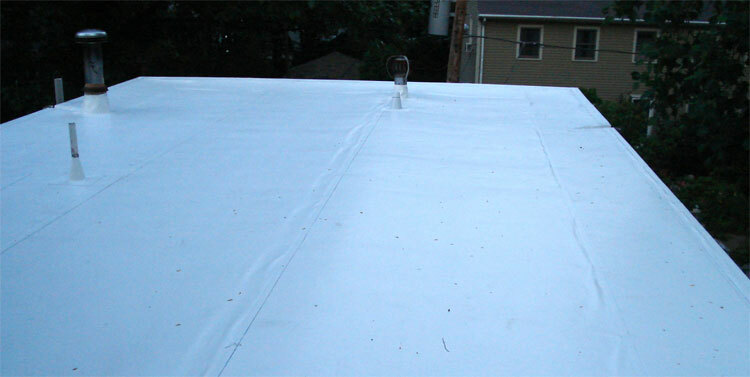 Step 3) To prevent more damages to your roof, interior of your home, or the inventory and the equipment of your business, it is a good idea to put up a tarp on your roof, until you choose a course of action – either fixing it yourself or choosing a roofing contractor to repair or replace it. Step 4) Estimate the real cost to a repair flat roof. Learn what is involved, what the hidden costs and fees are, and why we consider flat roof repair to be “sunk cost”. This comparison will help you decide if it is time to finally replace your flat roof, or if repair is a feasible option. What happens if you ignore roof leaks for some time? Once a flat roof starts leaking, the interior damage will span from stained ceilings (in the best case scenario) to thousands of dollars worth of repairs. Falling sheet-rock, electrical system damages, popping hardwoods and destroyed carpets, damaged furniture and home goods – these are only some of the outcomes of those leaks. Patching these leaky roofs may seem like the best solution and the cheapest way out, but, in reality, it usually turns out to be the worst solution. Consider the following: first you incur the cost of patching the roof + fixing whatever damages the leak caused to the interior. Then, in 3-9 months, depending on the type of roof covering and quality of the patch work (which no contractor will ever give warranty for), your roof starts leaking again – maybe in the same place, maybe in a different one, but the process is irreversible. This is because a patch is only a temporary solution and usually will not last. The roof will keep leaking, and every time you patch it, you will throw away your money. Due to a wide scope of flat roofing materials and different roof problems that cause leaks, it is virtually impossible to cover everything that is related to flat roof repair in one article. For your convenience, we have several DIY roof repair guides for a specific flat roof type and specific repair methods. These guides are easy to follow, and are aimed at both home and business owners. The biggest issue for homeowners with DIY rubber roof repair is actually obtaining the EPDM roofing materials, which are usually sold only through distribution, and only to roofing contractors. If you are a homeowner looking to buy Rubber Roofing supplies, such as: uncured flashing material, cover tape, seam tape, roof cleaner, primer, etc., it is best to contact local roofers and buy those roofing materials and flashing from them. Roofing contractors may also sell you a piece of rubber membrane, which you would otherwise have to buy as a 1000 sq. ft. roll. There are essentially two methods of rubber roof repair, or rather two types of flashing materials that are used to repair it. First, is the older splice adhesive method (black rubber glue) applied directly to the membrane. Second, is a newer / better Peel & Stick method, which provides faster and better adhesion and lasts longer. Repairing a Tar and Gravel roof is simpler than fixing a rubber roof. All you really need to do is clean the leaking spot, apply tar, reinforcing mesh, and put gravel over your patch. The biggest problem will be finding the roof leak. Unlike a rubber roof, where it is easy to find a separated seam or flashing, a tar roof is covered with loose gravel, and you do not actually see any holes in the roof. Check out the Tar roof repair video below. Tar & Gravel Roof Repair – learn how to detect and repair leaks in your Built-up or Tar-and-gravel roof, using inexpensive supplies from Home Depot, Lowe’s and other Home improvement stores. Whether your roof just started leaking or the water has been coming in for some time now, we recommend that you take a hard look if you should repair or replace it! For decades flat roofs in New England have been posing problems for home and building owners. Harsh climate, outdated roofing technology, and very often – standing water, are the major factors affecting the lifetime and performance of flat roofs. The majority of these roofs were not ‘designed’ to withstand leaks or to be properly repaired. The best you could do to repair a flat roof was to pour some tar on the leaky spot. In fact, tar was pretty much the only feasible option. Unfortunately, after a short period of time, you had to fix it again, as tar would dry up, crack and let the water in. New leaks would form elsewhere. As you see – it is a constant repair cycle until a new leak begins and more money is spent. When your roof starts leaking, repair is the first option that comes to mind. In this situation, you begin to think about the costs of repair, and ways to minimize them. Depending on the severity of the leak, this cost may be just a few hundred dollars, or a few thousand dollars. Here is why: when you begin to see a stained ceiling in your bedroom, it is the last stage of the leak. It means that your roof has been leaking for some time now and finally, after the last heavy rain, it showed up on that ceiling. It also means that the water had to completely soak the insulation, roof deck and rafters before you could see it on the ceiling. Therefore, if you choose the cheapest and most common solution, which is patching the flat roof, you will leave behind the moisture trapped under your roof. This will cause the rotting of your deck and rafters, since there is no way for that water to escape. Such repairs are a perfect example of sunk costs which cannot be recovered, and the fix lasts only a short period of time. After a series of these repairs, the owner gets sick and tired of it, and gets a ‘new’ roof. The homeowner may get a different type of a flat roof, which unfortunately would have the same inherited problems as the old one, but would carry a different name and would be made of different materials. This seems like a very sad situation for somebody with such a roof – doesn’t it? As an alternative to repair, many homeowners consider building a pitched frame roof with asphalt shingles on top of their flat roof to stop the leaks. However, there are two problems involved here. First – such an ‘upgrade’ is very costly and you would still have to re-shingle your roof every 12 to 15 years. The second problem is more complex. Adding a sloped roof on top of a flat roof, might be a pretty straight-forward process if you have a small rectangular house. However, that is not always the case. Many homes have odd shapes, multiple levels and a mix of pitched and flat roofs. Now, if you have a 200′ x 100′ factory, that task becomes extremely difficult to implement, and I will not even try to guess the costs involved. Repairing a flat roof in Massachusetts can and often will cost more than you anticipate (in other parts of the country, market conditions may be different, but the following prices should be just about right). Let us see what goes into the price of flat roof repair. 1) Cost of patching a flat roof – you can expect to spend anywhere from $300-500 or more. If someone offers you to fix a flat roof leak for less than $300, that person either desperately needs money, or is not a professional and does not know what is involved in a flat roof repair (unless all that has to be done is to apply a bead of caulking, something you, the homeowner, can usually do yourself). 2) Cost of interior repairs – fixing wet sheet-rock, painting ceiling, etc, – $250-400. If it is just a stain on the ceiling, then you can pick up a gallon of white paint at Lowe’s or Home Depot and do it yourself. Cost of Your Time. When your roof starts leaking, you do not usually wait until the weekend to take care of it. You grab a phone book and start calling local roofers, or someone in the trade, whom you know already. You set up the earliest time for the roofer to look at your roof and to give you the price. 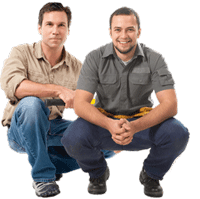 You may get a few more people to look at your roof leak, but since it is more of an emergency, you need to fix it NOW. Therefore, you typically give the job to the first reasonable and seemingly professional bidder. Unfortunately, leaks usually start when it is least convenient – during the week, at night, or when you are away. As a result, you have to take a day off at work to meet with the roofer, thus you have to use your sick or vacation day. If you make $20/hour, then you just lost $160. Do the math. Let us be conservative and use the low numbers – you are looking to spend at least $300+250+160 = $710 in direct and indirect sunk costs, which you cannot recover. Keep in mind – it usually will not be that cheap. You will also usually get what you pay for. When six month later your flat roof starts leaking again – double that $710 = $1420 – money that you could, for example, spend on updating your kitchen and actually enjoy. Flat roof repairs are a waste of money. They last only a short time and are not covered under warranty. If you opt for a more expensive repair, such as acrylic, urethane or aluminum powder-based coating from Home Depot, you might face an issue of incompatibility, as well as others issues. Also, you need to understand that aluminum roof coating is NOT a roof repair solution – it is merely a reflective surface for black roofs. However, many “roofers” suggest using aluminum coating as a roof repair option. Additionally, a good acrylic or urethane coating will cost you as much as 60% of a new roof. In the end, when you finally decide that you are sick and tired of repairing your roof and wasting money, you may have spent as much as it would cost you to get a new IB Flat Roof. This is what happened in our Case Study (see the case study at the end of this article). Replacing a flat roof is what we recommend 99% of the time. If you are not in a big rush and can wait a day or two, ask your friends and neighbors if they can recommend someone. See if there are flat roof houses nearby, and talk to the owner. They must have encountered a problem with their flat roof in the past. Use Angie’s List – real homeowners on that website, discuss local service businesses including roofers. Contractors have no say in what others write, and cannot buy advertisements. Do not use referral services like Quality Smith or Service-Magic, as contractors go to them when they cannot find any work – possibly due to a bad reputation. Their so-called pre-screening is nothing more than obtaining a copy of a Contractor’s License. All that these companies really care about is getting paid – not your satisfaction. Contractors pay for these appointments anywhere from $50-75. That is how you get ‘free estimates from 3 contractors’. Finally, replace your flat roof as soon as you can afford it. Stop the endless repair cycle once and for all. Choose a new flat roofing material that you can trust (IB Roof) – not the inferior, but cheaper option like EPDM rubber roof – which most roofers will offer you because it attracts many homeowners due to low price, but does not hold up well (which the roofer will not tell you about). In October of 2006, we received a call from a homeowner living on the East Side of Providence. We had just completed a flat roof near the Miriam Hospital, and the homeowners calling us happened to live in the same neighborhood. We scheduled an appointment with them, and at the meeting they said that a new rubber roof was installed just a year ago. However, this new roof was leaking like a sieve, and they actually had to remove a skylight to get rid of the major leaks. It did not eliminate their problems though, as there were other leaks here and there – mainly around a hot-stack pipe. After thoroughly examining the roof, we came to the conclusion that repairing it was not an option, as the system installed there was not up to the task. First, due to the roof’s shape, two large puddles of ponding water formed in the center of the roof, including the spot where a badly leaking sky-light once was. Since the EPDM rubber roof is not designed to withstand ponding water accumulating on the roof, the water was slowly coming inside the house through the failing seams. The second problem was the round-shaped hot-stack pipe that was patched a number of times, and was still leaking. A new 50-mil (membrane thickness – 1 mil = 1/1000 of an inch) white IB roof was chosen to replace this nearly new, yet badly-leaking rubber roof. With IB’s pre-made pipe flashings, the leaks around hot stack pipe were eliminated. The ponding water was no longer an issue, as hot-air welded seams created a permanent water-tight protection for this roof. The cool roof properties also made this house more energy-efficient than before. In the end, these homeowners finally eliminated all their roofing headaches and are now covered by the best roof and the best lifetime residential warranty. You can find more photographs of this roof here: Flat roof in Providence, RI. I do observe you have a good method to repair or replace the roof. However, I would happy if I can meet your physical presence to share me a quote for the roof and the ceiling if you work on it. Please, get me an appointment specifically in the morning any time. Your assistance is very importance for me. You are either lying or don’t know what you are talking about. EPDM pond liners are SEAM-LESS – they have factory seams, which melt rubber together – not glued seams. If they were glues as you do it on the roof, they would ALL leak! Heat gun can be bought for less than $300 and is more than enough for occasional repair. For professional roofing, you want to have a Leister Triac had welder, because they last for decades. Rubber’s weakest point is the glued seam and flashing, and that’s what makes it a bad roof system. Finally, instead of bashing a fellow roofer from 1500 miles away, you would be better off reading and understanding the point i’m trying to make. I never said EPDM membrane is bad. It’s the glued seams/flashing that make rubber a weak/bad flat roof product. Best of luck fixing bike tires. No – warranty would be null and void if someone puts screws through my roof. And same goes for MOST contractors. However – if for example you put a screw through a roof under warranty, and then seams come apart as a result of poor workmanship, and it’s 100 feet away from the screw, and your roof leaks where the seams come apart. Is roofer responsible to fix it? I would feel like yes. However – I’m not a layer and I did not read your warranty. In any case – making penetrations or alterations in a roof, will void warranty. So think twice about it. I have leaky flat decks. Can anyone provide an update on the pros and cons of: IB Roof single ply PVC versus elastomeric coatings like Metacryllics? David, from what i’ve seen, coatings don’t hold up well. That said, there are so many of them, I can’t say that for all of them. But with my extensive experience with IB/PVC and comparable costs, I recommend a full membrane (PVC). I have a flat roof that needs to be replaced. Can I walk on an IB roof? I need to get onto the roof frequently to remove leaves and other debris, as I have a lot of mature trees on my property. I have a tar and gravel flat roof on an addition, about 250 square feet. I would like to cover it with liquid EPDM rubber but have to prime it first with an epxoy type primer in order for the rubber to bond. The problem I have is that trying to put the epoxy on the gravel roof is very difficult. I got as much of the gravel off as I could with a leaf blower but when I tried to apply the epoxy primer, it is so think and sticky that the roller and the brush pull gravel loose from the tar and it makes applying the epoxy almost impossible. The epoxy primer is expensive, about 160 bucks for 2 gallons. Since the surface is irregular it is very hard to cover. Two gallons is supposed to cover 250 square feet but it only was enough to cover the edges of the roof. The problem is the irregular surface. The primer ponds in the spaces between the gravel which is stuck to the tar. I cannot see why anyone would ever use a tar and gravel roof. Unfortunately I bought a house with just such a roof on the addition. Hello all I have a leak but I have no idea where it comes from! My roof is completely dry when I check up there when it leaks inside my house! Any suggestions? What kind of roof do you have? Is it a tar and gravel flat roof? Check the edges where it meets the gutter. If you have a gravel roof you may not be able to see it if the edge has come loose allowing water to seep under it. Once there it can travel anywhere under the flat roof. It is hard to notice that the edge is no longer bonded because of the irregular surface and the sand and dirt which accumulates there. If the roof is old enough for this to happen it is probably time to have it replaced. A flat roof with a truly flat surface which can be rolled with a roller will allow you to put apply EPDM rubber, either sheet type or liquid. These roofs last at least 20 years. They can take ponding water 24/7 all year long without leaking. I am a maintenance Engineer for properties and i have had real issues with flat roofs for the last five years here in Kampala, Uganda. Though am one of the respected brains in attempting to solve flat roof problems, i am personally still looking to do better. In reading this article, i was fascinated with this 1B roof solution and am thinking i want to adopt it. Please educate me how i can be helped to venture there. The metal drip edge that is installed completly around the slopped flat roof edges, is it installed over the roofing material or against the sheeting under the roofing material? We are having a disagreement about this. Patching is not acceptable. The only way to go is new roof. Yes, 50 mil IB roof is an excellent product. You get lifetime material warranty, labor warranty form installer, and can also purchase an All Inclusive NDL extended warranty from IB Roof Systems for 20 years. If you have falling tree branches concerns, 80% thicker). Otherwise, both roofs will last 40+ years easy, and will be equally good at preventing roof leaks. Are there are IB Roof Contractors in the Los Angeles area? This is fantastic information. I didn’t know that a good acrylic or urethane coating will cost you as much as 60% of a new roof. Do you have to get a new acrylic coating every time you replace a roof? I was also wondering if you could tell me anything about roof warranties. If a roof is fairly new, is there a chance that the roofing company would be willing to make repairs free of charge? I have found that flat roofs can have many problems and require that from time to time you pay attention to the roof. Neglect can cost you big money. Rain and snow can accumulate in one spot if it doesn’t drain properly but if you take the time to look at your roof every season or quarterly you can spot potential problems before they become an issue. Also after a bad storm you may want to give it a quick look as trees, hail, wind or other roof damage may have occurred. There’s an article “Ways to know if you need a new roof” that you may find helpful. I have a tar and gravel roof. I’ve noticed areas where the gravel has washed away and the exposed tar is dry and cracked. What repair method would you recommend? Leo, our church in texas has over 10,000 SQ 9 years-old TPO manufactured by Stevens Roofing System. the roof started to have leaks from various spots 3 years ago. the roof has no ponding issue. we called the original installer to fix the leaks on our expense. but the situation was not improved. (1) apply elastomeric coating on top of existing TPO, or (2) lay new TPO on top of existing one. by reading the discussion in your title “Single-Ply flat roof system: PVC vs TPO”, i have 2nd thought of TPO. i will contact a couple of IB contractors next week locally. how do you think about the elastomeric coating? is it reliable? I would stay away from elastomeric coating, or any coating for that matter. Every flat roof coating job I’ve seen – be it on rubber roof or other single ply (such as TPO or PVC), the coating starts chipping / peeling and if such roof leaks, it becomes impossible to fix it, by applying original type material, as coating is in the way. And scraping the coating off is very problematic, time consuming and expensive. I would recommend IB roof. As you can see, you are having what I believe a material failure – not improper installation, although it could be a combination of both. So don’t install another layer of TPO. PS, I have some questions for you, so I will send you an email. I live in Montreal Quebec Canada. I have a 43*52 flat roof composed of tar and gravel with 15 upside down J shape ventilations. I was told that have been done 15 years at the time that I bought this house in Aug. 2008. After the 45cm snow storm passed Montreal Thursday 27 Dec,next day water sipped through the ceiling of a living room in one of the unit next to the roof, water started to form the guttes, but not drop then dried out the next day. I had the whole roof clean up the 29th, today in the same unit, in one of the sleeping room, the same problem in the living happened in that sleeping room. After yours specialities, what is the most closest cause to this phenomements? The contractor that I hired to clean snow on roof told me that might be that the roof is to old that the heat is lost, caused snow to melted because there was ice on the surface of the gravels, caused cold atmostphere under the roof then moisture warm air rise meet the cold air, water develope. Or the ventilation were installed in all direction, wind blowed snow into them, snow then melted and water collect on the ceiling of the living room which is direct below the ventilations that oppose the wind. My questions are if these scenarios above are true. what can I do to stop the water form inside this unit until the summer for a complete roof change? I am in a difficulty finacing now, however if must change the roof now, How much more will be in the middle of winter to change a roof of this size? What kind of the roof will free me problem like for the next 30 years? How do they calculate the cost? An extra questions, Can you please recommand me any trustful roof cover contractor. I was told that my roof is warranty 25 years, I tried to tract the contractor that did my roof, it does not exist anymore. I am very appreciate wether you can help me or not. Happy newyear to you and your family. Sorry to hear of your troubles, and that your original roofer is ditching you till next year. To help you i would need to know what type of rofing material you had installed, if tuetr is any ponding water on your roof, and where you are located. It would also be very helpful if you could send me some pictures of your roof. You can email them to leo @ coolflatroof.com (no spaces). I’ll take a look and see what i can recommend. Tar and gravel roofs are a problem for the inexperienced roofer or building owner. They are a very good roof if installed right. I have almost 40 years of experience repairing all types of roofing systems. They all leak. Metal, PVC, Tpo, Mod bit, Bur,or rubber the roofs are only as good as the roofer applying them and the maintenance provided. A tar and gravel that does not pond water is well worth the investment. With single ply roofing you only have one ply of protection. Step on a screw and you have a leak. Have a branch fall on the roof and you have a leak. Have a piece of metal blow across your roof and you have numerous leaks. The gravel on a hot tar roof provides protection against numerous types of punctures as well as protection from UV rays. When ever repairing a tar and gravel roof remove the gravel as a good bond is important in any repair. Never go over wet when it can be avoided as moisture will come back at you later. Depending on what type of flat roof you have repairing it with Andek would work great. It has a ten year warranty. If your sheetrock has water damage chances are there will be more like your insulation or the studs. I am about to purchase a home, which has a balcony on top of the garage and this part of the house has a flat roof. There are signs of water leaks all over the garage ceiling. According to the owner there are leaks only when it rains. What would be your recomendation on how to fix or solve this problem. Owner states that this has been going on for about 5 years,do you think there could be damage to more than just the sheetrock? Thanks in advance. Dude – because of “roofers” like you who can install a flat roof after “reading on the internet for a few minutes”, we have plenty of work cleaning up your mess, tearing off 1 year old roofs, and installing new roofs for homeowners who went with lower price guys like you. Can you recommend a roofer specializing in flat roofs who works in the Washington DC/Northern VA area? Thank you. I just added a list of six IB Roof installers in Washington DC metro area, to our IB Roof Contractors Directory. I can’t recommend anyone in particular, as I do not know these guys, but they are certified by IB roof systems. Hi, I own half of a duplex that has a flat, tar and gravel roof. 7 years ago I replaced my 1/2 of the roof and at the same time asked if they could put some insultation board down. They did this. Every year for the last 10 years I get a leak in the winter time from around one of the pipes that lead outside (fortunatley it leaks into my tub)and have had the roofing company come out several times to fix it. It’s still there. In addition to this, my neighbor in the other half of the duplex, for the last two years has complained that the water now pools on his side of the roof and he is having to replace many of his ceilings. Is it possible that the roofing company lifted our drain pipe, which runs down the centre of our units, when they added the insulation to my side of the roof and ruined the drainage system? What should my neighbor do? His half of roof is more than 30 years old and I guess he can’t afford a new one. 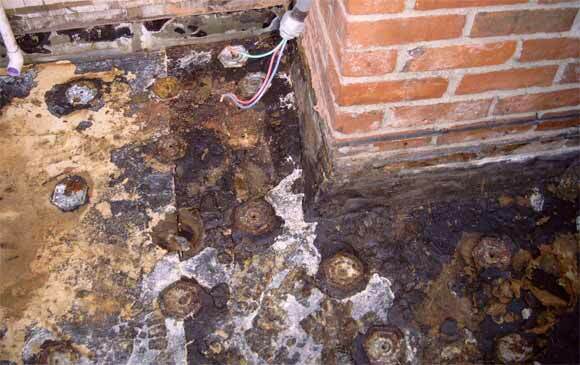 First, before any diagnosis, you need to send pictures of the roof, the pipe, and the drain. As far as your question – everything is possible. Your neighbor NEEDs to replace the roof, as most flat roofs do not hold up to ponding water.Where did the water on neighbor’s side go before you replaced your roof and raised it up with insulation? Once again pictures would help a lot. For now – your neighbor may try to patch his roof and see how it goes, but long term, they need to replace it and have it same level as yours (also add insulation). I have a twin duplex house with a roof that is 10 square,I have a flat rolled roof it doesn not have any tar or gravel on it i know its not rubber, recently i developed a leak and had a roofer look at it,i also noticed cracks in the seams about 2-3 mm wide, he said the roof needed to be relined and the cost for it was $3100. My question is can i just patch the leak, and if not is this estimate right for this kind of a job, I live in Allentown PA. ps he charged me $70 to put some roofing cement and that mesh on the leak, is that a fair price for that patch job? Your help is appreciated. I currently rent an apartment that recently went under foreclosure – so I’m not paying rent to anyone because I don’t have a landlord. I’m a single 26yr old female so needless to say – leaky roofs are NOT my specialty. lol Anything I can do to prevent further damage from a flat roof (rubber I’m assuming, but like I said – I know nothing about this). I want a quick fix, don’t care what it even looks like on the inside…just would like to last a couple months. But some spots are quite soft, and I had my first drip today. I shoveled all the snow off the roof in the spot it was leaking and it appears to have stopped for now…but its making me nervous. I know this isn’t very detailed, any suggestions?? As far as what you should do – I can’t really answer that for you. I can give a technical advice, but because you are renters, you don’t have any knowledge of what the roofing materials used on your roof are, and why the roof is leaking. Therefore, I can’t even give you a technical advice, unless you get above info from the maintenance guy or the landlord. PS, where are you located? If anywhere in MA CT or RI, have your landlord contact us, and we might be able to help (depends on how much your landlord is willing to spend). I live in a rental (basically an old house that was converted into apartments) that was built in 1909. About a month and a half ago, my fiance and I starting noticing that one of the tiles in our drop ceiling in the living room was beginning to sag (and to a lesser extent the tiles around it, too). I e-mailed our landlord a little over three weeks ago, and he sent out a guy from his maintenance crew out to find out what was happening, and discovered there was a leak in the (flat) roof. He removed the tile and replaced it with a plastic bag which he poked a hole in to let “water” drain into a bucket on our floor. He then attempted to patch the roof, and came back several times on different occasions after it kept leaking (it has been leaking black, oily roof sealant). Our landlord then decided that the roofing company he contracts with should come out and take a look. They, too, tried to patch the roof, and it continues to leak roof sealant. I contacted our landlord directly last week after failed attempts to get someone out to the apartment again, and he told me that they were doing everything they could to get it fixed asap, but that nothing could really be done right now because it’s been too wet and rainy. My fiance and I are getting really fed up and frustrated because it sounds like no one knows what there doing (and that maybe our landlord is stalling because he doesn’t want to pay to get the roof replaced). Any advice you have would be greatly appreciated!! which has a flat tiled floor which is leaking in several points into my lounge. The roof was replaced by the builder about a year after the house was built in 2006, unfotunately the builder cannot be contacted regading any problems on our development so it looks like it is down to me. So any advice would be welcolm I am trying to avoid taking up the whole roof again if this can be avoided. Before I can give you a better answer, I need to know what is under the tiles – there should be a waterproofing membrane of some sort, as tiles are just for walking (as I understand). So best thing would be to lift a few of them and and take a picture of it and send to us. Failed seams – my guess is that you have a rubber roof under these tiles / pavers, and it is possible that the seams were done badly. Membrane damage – if pavers are sitting right on the roof membrane, they could puncture a hole in the roof. You need some protective layer between the pavers and the roof. Possible drainage issues – is there a roof drain in the center somewhere or does the water run off to the side. Is there any ponding? To check this, I’d lift some pavers here and there and run a water hose and see if water runs off or if it ponds – ponding water is another common cause of roof leaks. I have a two year old flat tar and gravel roof . After the new roof was installed, I now have a leak and there is a relatively large bubble in a different area.. It has taken the roofer 2 years to respond to our problem. Last week he put more tar over a seam that he believes is where the leak is. He says he doesn’t want to repair the bubble because it is not leaking and is more likely to leak if he does the repair. What should I do? I’m sorry to hear that you got irresponsible roofers who take two years to fix a roof leak. Since you wrote this comment, has the roof leaked? Basically, i’d like to know if their roof fix worked. About the bubbles – I would not touch them unless they do start to leak. Problem with tar and gravel roof, is that they are very difficult to even diagnose (find the leak) and also very difficult to repair. The only repair solution used to fix these roofs is to basically slap tar over potential leak. You can’t really clean the repair surface as there is all that gravel embedded in the top tar layer, and all the dirt stuck to the tar, so the patch does not hold for too long. If I was fixing such a roof, I’d actually use Solar Seal 900 caulking instead of tar, and try to clean the repair surface as best I could. As for what you should do – depending on where you are located, you could go through department of consumer protection, to have these guys fix or replace the roof, if it was officially classified as defectively installed. However, replacing it at contractor’s cost is highly unlikely. Next, time you have to change the roof (hopefully not any time soon), do not go with tar & gravel or asphalt or modified bitumen or rubber roof. Get PVC roof – it will be more expensive, but you will never have to deal with issues like this. Most PVC roof installations are done by trained pros, and even if there are issues, the repair is rather simple and effective. Good luck, and let me know how it goes with the roof. I live in Phoenix and have a 6-yr old foam roof. I have a bubble that’s about the size of a dinner plate. How do I repair it? Of course $23000 is a lot of money, but that also means a very big roof – if you used our roofing calculator to arrive at $23k roof price. Also, spending the money on the roof does not seem as “fun” as spending it on the backyard – you never “use” the roof while backyard is used all the time. But if you let the roof problems progress, your roof repair / replacement may exceed $23k, as the substrate and framing may begin to rot. As far as your roof right now – you may try drying it first, and re-seaming the roof (i understand it’s a rubber roof) – here is a guide for rubber roof repair. You can’t get rid of bubbles as they are the result of bad adhesion between the membrane and insulation. Solving ponding water is also a right thing to do but not without removing old roof and installing new one. So yes – if you don’t want to spend the money on new roof, repair this one. I would like to remove my flat roof and add a slant to it , how would I go about this? What a great website. I have a simple question – what kind of adhesive do I use to glue down an edge on a quite new PVC roof? It is all our fault and I just want to glue it back down. Thanks for your appreciation of what we do in trying to educate homeowners and building owners / property managers about roof leaks and roof repair issues. As far as gluing the PVC to the drip edge metal – depending on the manufacturer of you PVC roofing material, it should actually be welded to the drip edge (which should have PVC clad – thing layer of PVC material attached to the metal). If you can’t weld it down for one reason or another, I would try to use PVC cement (if your drip edge is in fact PVC coated), or contact the manufacturer. I know there are some glues that you can use, but I really never had to actually do it, as our PVC roof system is 100% welded together, and we don’t use and seam adhesive. Actually my roof top kitchen went through a great leakage. the former contractor said that the rain water down pipe could not sustain the water capacity. they used bigger diameter plus hacked the original concrete and added new concrete. but then still unsolved. Should i use epoxy to fix the hairline cracks and lay waterproof on the flat roof surface? i have an epdm roof on my 21,000 sq ft warehouse. there are leaks everywhere. i have a contractor telling me that he can coat my roof with a product called Andek. the price he gave me is $2.65 per sq ft which includes materials. there is a 10 yr product warranty. he is certified by said company and has a nice portfollio on prior roofs. is this product worth $2.65 a sq? is this going to stop my leaks? Hello, I have a TPO flat roof and water is starting to puddle in the center because of settled beams. I am wondering how to go about installing a drain in the center of the area water is standing. Any help would be great. Here is a video describing installation of clamp-ring roof drain on the IB roof. Same installation techniques should be followed to install such roof drain on your TPO roof. Before you cut the roof and install the drain, you’ll need to get the drain plumbing system ready. I’d recommend 3 or 4″ pvc pipes, and matching roof drain. This of course is a big production and you will need a roofer with hot air welding equipment to help you. What state are you in? We bought a house with a flat roof ~3 yrs ago -it had a lot of water damage and mold damage due to a leaky roof. The first thing we did was install an IB roofing system. We had leaks the first year-in our master bath around the exhaust fan and by our chimney. The contractor who installed it can’t seem to figure out why they are leaking and has yet to fix a thing…..3 yrs later…. we now have water damage on our downstairs ceiling right below the fireplace…..I believe it’s the flashings….I had the insurance adjustor out today…he will cover the inside damage that happened during the first year, but not the current issues we are having. Who’s at fault and do we need a lawyer? I’m very sorry to hear that you are having these problems, especially so with IB roof. I will hold from saying who is at fault – for now – as I had not seen the roof. It would be best if you email me pictures of your roof – especially the places where you suspect the leaks. Close-up pictures and from some distance will be most helpful for me to better assess your situation. Also a couple of interior damge pictures would also help. Did your contractor checked the seams with a probe and did a test cut of a seam? What kind of flashing do you suspect to be leaking? Is it a roof to wall flashing or chimney / skylight or something else? What state are you in? If you are in Massachusetts, Connecticut or Rhode Island, we can help you with your roof repair. We have repaired some IB roofs which other contractors installed and also other PVC roofs (non – IB). Please email me the pictures and I will be able to help you better. You can post your answers here. I’m also emailing you copy of my reply. I’d like to help you, but first – I need more information about you roof. First it is important to determine what type of roofing material is used to waterproof your building. Then it is important to know where the leaks are, if there is ponding water or some other inherent weakness in the roof itself. Then it is also important that the outside temperature be about 40 degrees or more, for most roof repair jobs to be effective, as in the colder temps the repair patch will not properly adhere to the roof. Once you determine all of the above, you can post this info here and I will help you to go through this repair. we had a local repairman put a metal roof over our rubber roof,big mistake,as we get heavy snows in vt.,and the ice,snow pushed the metal down leaving holes where screws went into hold metal dow,and roof leaked a lot.i wonder if normal house insurance covers this repair. Well, not to go into roofing basics, but water runs down, so it could be entering at a higher pint on the roof and running down to the lower point where it drips inside the building. That said, on sloped or slightly sloped roofs, water usually leaks when there is some king of obstruction or penetration that is compromised. Also if there is some kind of ponding that occurs on the roof, that is the most probable place of leak. It is a little difficult to picture your roof without photographs, so I can’t say for sure. If you want, you could email me some pictures, and i’ll see what I can find. Im working on a flat roof that is kinda domed shaped if that makes sence. There is a bad leak in one corner of the building but when i was there while it was raining I noticed that where the leak was driping from the inside was not where i think the leak is on the roof. I looked all over to see if i could find a breach in the modifed roof ( the rolls of material you flame down) but could not find anything tell tale signs. Ive been doing a little roofing now for the past couple years and have gotten good enough to do it on the side now, but i have been stumped on this one. The only thing i can think of is to bring the hose to the roof and use the plastic cement to make paths on the modified to see where the water will come in at? what do u think, kinda sounds amature to me. Do you have any tips for me? thanks alot. Second, I assume that you have a rolled asphalt roofing since you mentioned tarred seams. Also get a “Water Stop” or “Water Cut-Off” from local roofing supply warehouse to seal the drain to the roof. This stuff is great – It never fully cures ad holds off water very well. I have a roof where our IB PVC membrane was terminated into old built-up roofing, and there is always ponding water right where this connection is. The connection was sealed with water-stop and I told the customer that I can only warranty this particular spot for 6 months. Well, it’s been over 3 years and not a single leak! If you cannot put a drain in the middle of that puddle, I would first talk to town officials and explain the situation that because of their stupid restrictions, your roof is leaking. Besides adding a drain or opening the plugged drain, I think that it may be time to replace your roof. Rolled asphalt roofs do not last long anyway, and will never stand up to ponding water. I of course recommend IB PVC Flat Roof, but you also need to fix the ponding water problem. If you go for a new roof, you can use tapered insulation to divert water toward drains.